Gobekli Tepe image on Sumerian tablet? I have been contacted by independent researcher MADELEINE DAINES who has has been working through the contents of the Cuneiform Digital Library where she has found a fragment of a Sumerian tablet dating to 3500 BC and bearing a deeply puzzling image. The tablet, which can be seen in the accompanying illustration, appears to show one or more oval enclosures of the GOBEKLI TEPE type complete with characteristic T-shaped megalithic pillars. Gobekli Tepe itself was founded around 9600 BC and deliberately buried about a thousand years later after which it remained completely unknown and untouched by later cultures until the excavations of the German Archaeological Institute began in the second half of the 1990’s. We already know that Gobekli Tepe was not alone (for example the so far largely unexcavated site of Karahan Tepe, discussed in my new book Magicians of the Gods). But perhaps this rare image found by Madeleine Daines in the Cuneiform Digital Library obliges us to consider something more — namely that other sites of the Gobekli Tepe type remained in operation and were still revered by the Sumerians thousands of years after Gobekli Tepe itself had been “decommissioned”. In Magicians of the Gods I have already explored the possibility that many of the great civilizations of historical antiquity, including the civilizations of Sumer and ancient Egypt, inherited a legacy of knowledge and tradition from the founders of Gobekli Tepe who I believe to have been the survivors of a lost civilization destroyed in the Younger Dryas earth changes of 10,800 to 9,600 BC. 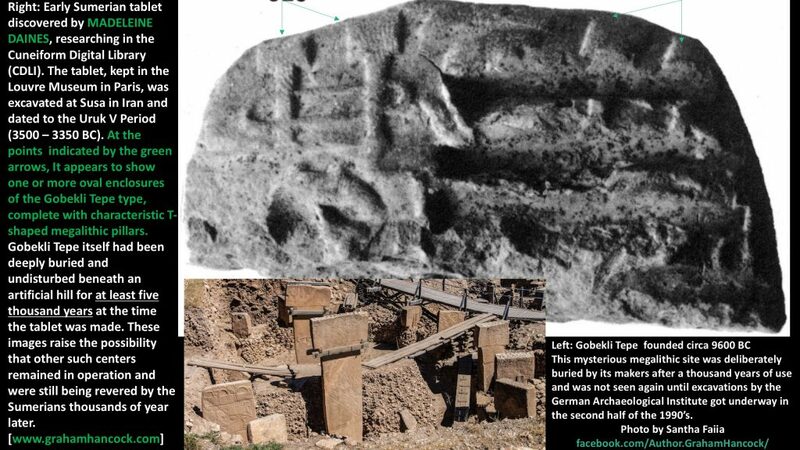 If Madeleine Daines’ discovery is what it appears to be then it may provide direct evidence of the transmission of the knowledge and traditions of Gobekli Tepe into Sumerian times. You can see the tablet Madeleine Daines found at the Cuneiform Digital Library Initiative through this link: http://bit.ly/1XjfBIU. It was excavated at Susa (now Shush in modern Iran) and dates to the Uruk V period, 3500-3250 BC). As noted it is a fragment of what was originally a much larger tablet.
. . . Fascinating! . .Cuneiform Digital Library, you say.. . You don’t suppose that that “loop” shows something to do with orbital loops and those ‘Thor Hammer’ like “T’s” markers within the circles characteristic of Gobekli Tepe. The context of what is marked on that tablet might yield a clue or two to say little about what ones’ imagination can do with this partial clay piece. 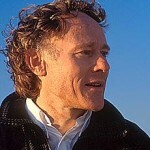 Then again one might be looking for patterns where there are not any to relate symbolic form and known meaning. Below those “T’s” and loop looks to be another circular form or is that just a Mars face trick of the light sort of thing? Those slight lines on the left side T’s almost look like partial fingerprints of a handler. Makes one wonder how many other clay tablets have what look like partial fingerprints on it, too. Not that it matters, today. It might be interesting to find out whether those markings indicate a place or coordinate, a visitation by the tablet maker or possibly a reference in context with the rest of what is deliberately marked on the remaining piece of the tablet. ‘Begs the question, “How many other tablets portray such symbols in context?” There might be a chronology reference to re-evaluate. Interesting puzzle piece. Thank you for the post. Graham, Thank you for posting this update. I understand that during the Younger Dryas period the Sumerians were at war with northern tribes that were breaking away from serving the Anunnaki overlords (gods – those who came from above) and the Anunnaki had just completely vacated Earth which caused the Urak V period to begin in 3552 BC. And yes, I agree with your statement that this type of stele post was in use in more than one location, but I also believe them to be the Family Posts (used in sets) as a meeting place foundations for oval tent supports and tie points. The Cuneiform partial map depicts an oval enclosure which matches my memory of this period. I believe the Gobekli Tepe site was buried because the Anunnaki had all of the rebel families exterminated for refusal of service to them (requiring annual farming and gold or other mineral payments to them). My past life memories go back 2,400 generations. Standing stones of all types had significant meaning for thousands of years before the present. How can she get the truth out there when it isn’t known? All that’s known is that a tablet has a representation of something that looks somewhat like something at Gobekli Tepe. Any answers to what and why are only speculation. another exciting morsel given to us from an independent thinker on a quest for truth. Well done, Ms. Daines!! I wonder if gobekli tepe was constructed as a planetary fertility rite as it appears very phallic in design.with each phallis being adorned with its targeted species.it would seem to make sense of the purposefull buriel of the sight afterward to promote inception,propagation.given the climate at the time it would seem serious concern for the future could have motivated such a level of dedication.also has there been any analysis of the divots on top of the T shaped pillars? The loop around the two T-shaped pillars reminds me of the Egyptian ceremony of Stretching of the Cord, which Seshat, goddess of the calendar, with her notched palm branch staff, performs with the pharaoh. Her rope is of hemp. Her headdress is a seven-leaved hemp stem. For analyses of complex engravings on two Gobekli Tepe pillars, see my Article on GH above, under Author of the Month, September 2015. Graham I’ve been waitin’ a long time for someone else t’notice this but since you’ve raised the subject of Gobeklitepe…wha’ the hey! He reckons the vulture’s the spirit of a shaman or some’n’ along those lines an’ I’ve no problem with that. But then two-thirds the way along the stone under the last basket who’s this…? Detractors’ll say it’s just pareidolia but look at what the face’s made of. Birds whose images’ve not only been trimmed in the most fantastical manner bu’ closely arranged to produce a prominent eye/eyebrow ridge a nose a mouth an’ a chin. T’the best o’ my knowledge even in Disney films long legged birds don’t sit upright with their feet fully extended out in front of ’em. I spotted this Robert Schoch thing around February this year http://www.robertschoch.com/articles/schochgobeklitepenewdawnsept2010.pdf an’ immediately thought “At last!” but he apparently hadn’t even noticed the face never mind how closely it resembles Easter Island’s statues in profile. Especi’ly when they’ve got their hats on. Somethin’ doubly underlined when you recall how big those Easter island guys were on godlike Birdmen an’ how’r Gobeklitepe guy’s face’s made o’ birds. could it be that a later rival culture over ran the original, and for political reasons buried the site rather than destroying it?